The USBUBLTB Lightning to Micro USB dongle for iPhone, iPod, iPad is colored to suit black mobile devices and provides a reliable solution for charging and syncing your Apple mobile digital devices using a Micro USB cable. The dongle offers approximately 4-inches in cable length, which lessens strain on the connector port and prevents damage to the cable, while also reducing the potential of blocking other nearby ports. The reversible 8-pin Lightning connector can be plugged into your iOS-enabled device with either side facing up, meaning there is no wrong way of inserting the cable into the device. 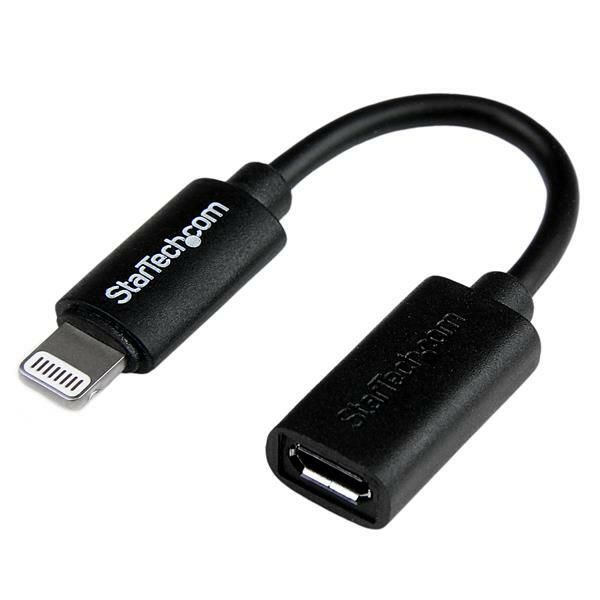 This durable adapter is Apple MFi certified and backed by StarTech.com's 2-year Warranty to ensure dependable performance.